Protect yourself, your loved ones and the planet by making your own cleaning products. It’s easy and you’ll save money too! Add enough water to nearly fill the bottle. The vinegar and tea tree oil both have great antibacterial qualities, and the orange oil gives the solution a pleasant scent. 8 drops of essential oil of your choice. Shake it well and it’s ready to use. Spray the cleaner on glass, windows, and mirrors and wipe until clear and dry using a newspaper. Learn these by heart so when you go shopping, you will be label smart! I love Wood Salad Bowls! Be green and buy wood salad bowls secondhand at thrift stores, yard sales or flea markets! I have found many great ones over the years, which I still use. Give the bowl a good clean before the first use. First, disinfect the entire bowl with vinegar, wiping the outside and inside. Let the bowl sit for a few minutes before rinsing with warm water. Wipe dry. To condition the bowl, use a clean towel, and treat it with food-safe oils like flaxseed, walnut or hempseed oil. Heat speeds the curing of flax and walnut oil. Placing an oiled bowl or spoon in the sun or near a wood stove helps. After a while wipe off any excess oil and store away, ready for use. Choose a time of day when your windows aren’t hit with direct sunlight, which can cause your cleaning liquid to dry too quickly, creating streaks. Rub away dirt using a sponge dampened with equal parts white vinegar and hot water. Wipe with a squeegee, wetting the rubber edge first so it doesn’t skip. Use downward, overlapping strokes, then pull across the bottom. *Clean them before storing. To deter moths, wash or dry-clean any garments that have been worn or may have stains. *To repel moths, use lavender filled sachets or cedar blocks wherever you store your clothes away. *If possible, hang your coat(s) in a cloth garment bag. Sweaters store well in canvas bins, which allows for air circulation to prevent mold and mildew. When was the last time you cleaned your fridge?! Store good items in a cooler. Discard any old or unwanted items and recycle the empty containers. Wash the fridge and freezer interior from top to bottom, including seals. Wipe it dry. Pull the unit away from the wall to vacuum the coils and cleanup the dust bunnies from underneath. Cleaning your fridge helps to remove potentially harmful bacteria that could be growing in a corner and cleaning the coils helps the fridge work more efficiently. *The hand-painted Smeg fridge is by Dolce & Gabbana limited series. To clean your shower and shower curtain, mix together 2 cups of water, 1/2 cup of white vinegar, 1/4 cup of liquid castile soap, and 20 drops of tea tree oil in a spray bottle. Spray the solution on the shower walls, curtain and floor, then wipe it down with a washable cloth. Make your own herbal incense by sourcing organically grown herbs in your garden or at a farmer’s market, such as bay leaves, lavender, mugwort, sage, Eucalyptus or Douglas fir. Clip the stalks of fresh leaves to 6 to 10 inches. Bundle the stalks and tightly press them together. Tie them with a natural fiber twine or string (try cotton) around its base. Leave a 3-inch tail coming off the knot. Continue wrapping the bundle with string all the way up, and when you reach the top, go all the way back down. Tie the string around the end of the bundle once or twice, then cut it off, leaving a 3-inch tail. Tie the two tails together to finish the wrap. Hang the bundles upside down in your home to dry for about 2 weeks. Once dry, fill a bowl halfway with sand, place the herb bundle in the sand, and burn in a safe place. Did you know… that tea bags can be used as an air freshener? Unlike artificial fresheners, tea leaves won’t overpower your senses and they absorb the stinks instead of masking them. To freshen up a car or closet, simply slip in a tea bag containing a pleasant blend like lemon or peppermint. To loosen caked-on food from pots and pans, sprinkle them with baking soda and add a little warm water. Let the mixture sit for thirty minutes before scrubbing. Measure 16 cups of baking soda, 12 cups of borax, 8 cups of Castile soap flakes, and 3 tablespoons of essential oil (lavender, lemon, or grapefruit) into a large rubber or metal bucket. Stir well to evenly mix them. Use a sturdy metal scooper to measure out the right amount to use each time and it can also be store in reusable containers. Conventional chlorine bleach, or liquid household bleach, contains sodium hypochlorite, which is highly toxic. Non chlorine bleach is a gentler more environmentally friendly option which uses hydrogen peroxide to lift stains and maintain both white and colored fabrics. It is oxygen-based and is used mainly for laundry care. Often used to treat mildew and mold issues at hime, conventional chlorine bleach can harm us, especially if it’s mixed with ammonia or vinegar (the combination creates toxic fumes). Instead, use white vinegar as a safe, natural and very effective mold and mildew killer. Soak a sponge in either full strength vinegar or use a spray bottle and add tea tree oil (the greatest natural mold and mildew killer of all) and some of your favorite essential oils. Soak the effected area and leave it for a few hours, then scrub the mold or mildew away with a brush. There are a million different theories about how people should take care of denim. Some say to never wash them — the CEO of Levi’s has admitted to wearing jeans for a year without washing them. That doesn’t sit right with some people, who prefer freshly laundered pants, no matter what experts say about the danger of washing jeans. 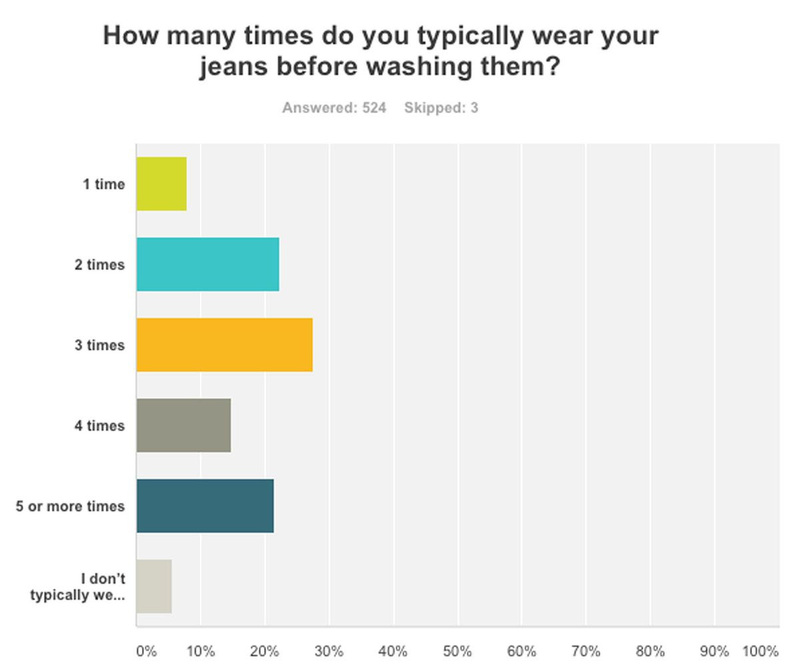 About 27% of people in the survey wear their jeans about three times before washing. About 21% wear their denim at least five or more times before putting them in the wash. These three knives are the ones I use the most. Two of them I get sharpened regularly and the middle one is ceramic and always very sharp. The importance of good knives cannot be overstated! Surprisingly, I often find it’s the best choice for a task, even if my kitchen has a mini food processor and the like. Here are the 7 essential oils to consider when starting to use them in your personal care products or homemade cleaning supplies. Many cultures practice the removal of footwear upon entering their homes, and slip on comfortable house shoes that are reserved for indoor use only. Taking off your shoes allows you to physically and mentally leave the dirt of the world outside. Taking your shoes off at home is one of the best ways to reduce your exposure to toxins and lead to a better quality of life, not only in cleanliness, but also in the comfort it provides. Combine all in a clean spray bottle, shake well and spray onto surfaces to be cleaned. Be careful when using this on grout–the vinegar will soften it. Best to avoid grout areas with vinegar. When it comes to your bed, a place where we spend practically half of our lives, create a cozy and comfortable bed free of potentially toxic chemicals. Many mattresses, sheets, blankets are made from synthetic, petroleum-derived materials that have been doused in flame retardants and treated with formaldehyde finishes. Now you know. So choose bedding materials that are good for you and the planet, such as WOOL, ORGANIC COTTON, NATURAL LATEX, LINEN, HEMP, BAMBOO or SILK. WOOL is a remarkable fiber. It regulates body temperature, keeping us warm in the winter and cool in the summer. It wicks away moisture and dries easily, which deters mold, mildew and dust mites. It’s also naturally flame-wrinkle-and-stain-resistant, static-free, 100% biodegradable and extremely durable. Choose a wool mattress pad or wool comforters. A wool filled pillow is a humane and healthy alternative to goose down, which can trap moisture and harbor dust mites. ORGANIC COTTON is more affordable than wool and is machine washable, making it ideal for sheets and duvet covers. If you choose a cotton mattress, because it’s not fire-resistant, wrap it in a wool mattress pad for added safety and comfort. Look for the GOTS-certifification for sheets, certifying that the cotton was grown without pesticides, insecticides, GMO’s and finished without toxic chemicals. Consider organic cotton bed linens in natural shades of cream that have not been bleached or dyed. NATURAL LATEX foam mattresses and pillows are free of the toxic petroleum based highly flammable polyurethane. Natural latex is a renewable resource derived from the sap of rubber trees and is naturally resistant to mold, mildew and dust mites. Look for GOLS ( Global Organic Latex Standard) certification to ensure the mattress or pillow is actually natural latex. LINEN and HEMP are highly breathable natural fabric choices, but are often hard to find and expensive. Check the labels to make sure that the fabric is free of chemical treatments. SILK sheets are very soft, expensive and aren’t machine washable. Choose “peace silk” which allows the silkworm to live. If choosing BAMBOO, choose Oeko-Tex certified textiles which are free from harmful substances, and the Forest Stewardship Council certifies sustainable bamboo forest practices. I saved this information from a piece I read in Mother Earth Living. Their labels list “active ingredients,” which are generally harsh or toxic- these are unnecessary for routine cleaning. * “Active ingredients” like ADBAC, benzalkonium chloride, names that end in “monium chloride” and “triclosan”. It would be so much easier to shop smart if all ingredients in cleaning products were listed on the label, as with food and cosmetics. But the government doesn’t require full disclosure. To learn more check the EWG’s Guide to Healthy Cleaning. I have removed all toxic cleaning products from my home and it feels great!